It has been a couple of years since we last talked web browsers, and a lot has changed since then. These days a good amount of our web activity takes place across multiple devices, be it smartphone, tablet or desktop PC, and the change has been reflected in browser market share. 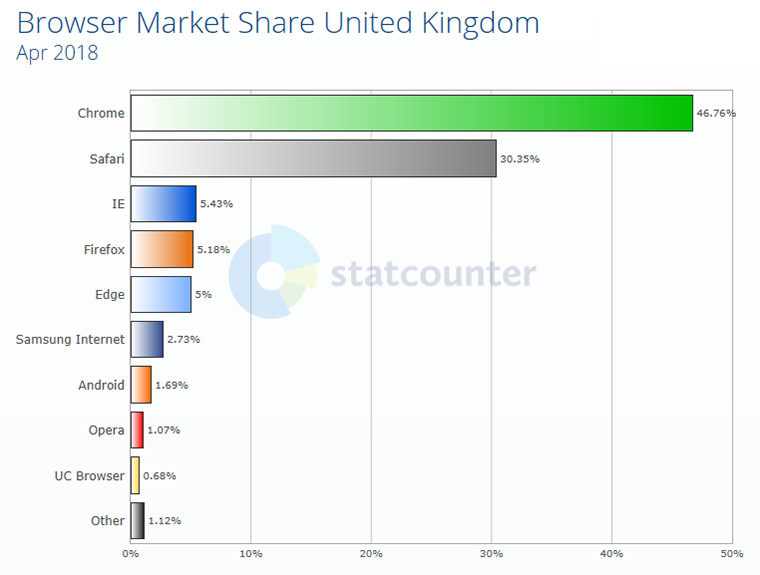 According to Statcounter, Safari is the second most popular web browser in the UK, thanks of course to the great many users of iPhone and iPad products. Topping the chart is Chrome, which dominates both the smartphone and desktop landscapes, while the likes of Firefox and Edge are well off the pace. We're using our web browsers on an increasing number of devices, and with the ability to pick up where you left off through synchronised data, it often makes sense to use the same browser on multiple platforms. But which is best? To help canvas some opinions, we're asking: which web browser do you prefer? Let us know your pick of the bunch, as well as your reasons for or against, using the comments facility below. Since Mozilla willfully destroyed Firefox it's Waterfox for me. I do have Chrome installed, but I avoid it whenever I can. I just don't like it and there are some long standing annoyances they just seem unwilling to fix. That, and Google's snooping. Oh, and I almost forgot, I don't surf on anything but a desktop computer. I have Mozilla installed for testing and IE for corporate stuff. I don't generally like making life difficult for myself so I tend to stick to mainstream flavours rather than farting about with some back alley browser. Firefox. I seem to be one of the quiet ones who likes the updates quantum brought.